Candlesticks made of metal, wood, ceramics and even magnetic. From beautiful Danish design brands such as Normann Copenhagen and By Lassen. Would you like to have more atmosphere in your interior? In the evening lighting a candle is a small gesture with great effect. The Scandinavian candlesticks in our collection are so beautiful that they also form a design home object during the daytime. Take a look at the minimalist, sleek candlesticks of By Lassen, for example. Made of brass, copper and metal with black or white powder coating. From Normann Copenhagen we have the lumber jacket, the wooden classic. Do you prefer ceramic candlesticks? Take a look at Kohler Design: we have handmade candle sticks all year round for you and special Christmas versions for the December month. 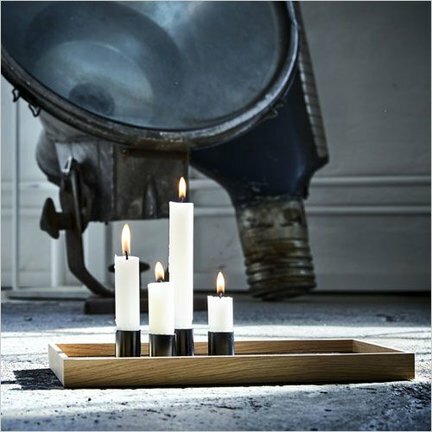 Even for a tray with magnetic candlesticks you can come to us. These are made by the cool Danish gentlemen 'The Oak Men'.